The Dollar/Yen lost ground yesterday amid absent demand for the greenback ahead of a major US Federal Reserve announcement tomorrow. Continuous fears of a slowing global growth dented the bullish sentiment on this pair, despite equities trading to new yearly highs. Today, there are no economic data scheduled in Japan. 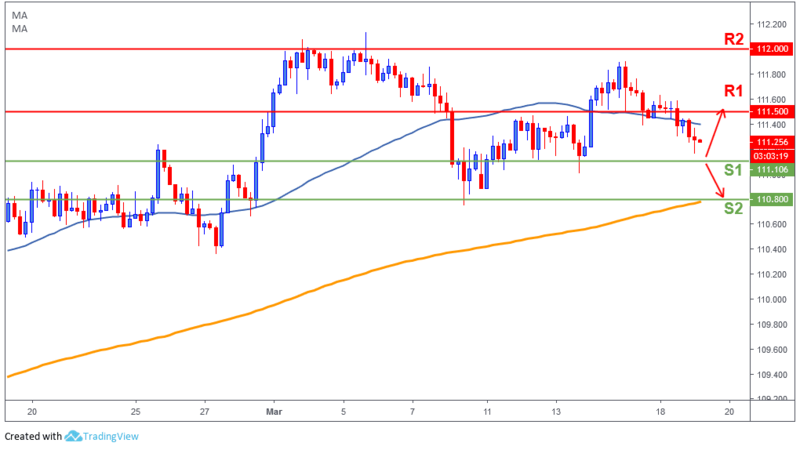 The USD/JPY broke below 111.50 support and the 50-day moving average (blue line). Price is currently heading towards 111.10 (S1) to retest it. A break below it, will open doors for a possible further weakness towards 110.80 (S2) and the 200-day moving average (yellow line). The bulls need to break back above 111.50 (R1) to take back control.